Before Netflix.. Before Hulu.. Before Amazon.. Before Redbox.. 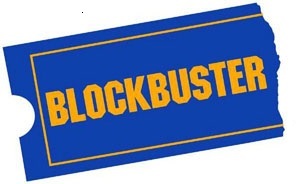 There was Blockbuster. Blockbuster rented out its final movie on Saturday, November 9 in Hawaii. I'll admit this news made me a little sad. Being a kid in the late 80s and early 90s, I have a lot of fond memories of the video store with the blue and yellow logo. No one ever ran into Blockbuster, grabbed a movie and left. Going to pick out your movie(s) was an event. You were there for well over an hour, went down every aisle and looked at every new release at least twice. You always talked your parents into buying a few snacks. And, more often than not, you were in your pajamas. I remember renting instructional cheerleading videos with fellow teammate Stacey. We went back to her house and mimicked the moves in her living room. I remember my first boyfriend Randall driving me to Blockbuster. 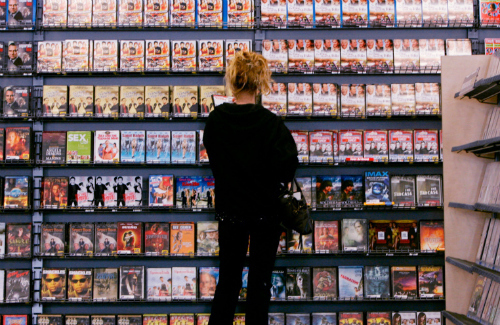 We would walk around forever just to end up renting something we'd never watch. We were too busy making out. One time, he actually picked out The Adventures of Milo and Otis. To this day, I snort any time I think about this. 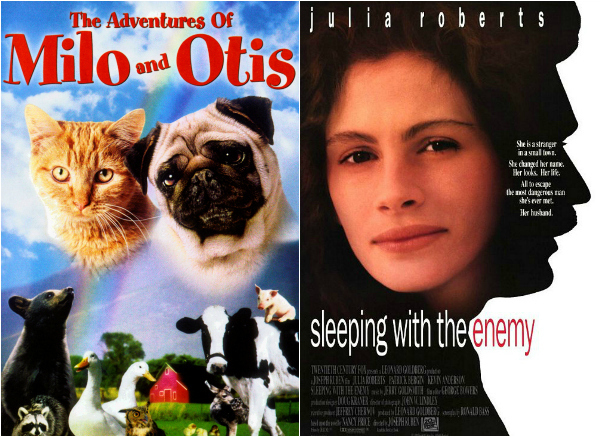 Nine times out of ten, my mom picked a Julia Roberts movie. Seriously, how many times can one woman see Sleeping with the Enemy? Now, if I want to watch a movie at home, it's quick and painless. I ask you. What's the fun in that? I remember Blockbuster very well! I remember my parents and I went there to pick out movies the day before a snow storm. I also remember returning the movies in the box outside. God! I have so many memories there! Ahhh, my fond memory is when I was freshman in college & you could rent 5 movies for $5 from the older movies. I DEVOURED the horror section (and some twizzlers) like every weekend! I will miss Blockbuster! Such a staple of my childhood. RIP. I used to love renting movies as a kid! VHS all the way! I'm going to miss blockbuster. It really was an event to go on a Saturday night with all your girlfriends. We still have family video here in Ohio which is pretty cheap, and still gives some of the experience. So I take Boomer every now and then. I loved the Blockbuster skit on SNL last week. It is really sad. Blockbuster was my savior when my dad and I moved from my childhood home to a different house. one without cable TV. I watched my favorite shows with rabbit ears - or downstairs when he wasn't watching TV (he had a cable box) - my reasoning was that I didn't want him spending extra $$ on me if I wasn't going to be there all the time (in college). So Blockbuster was my Friday night ritual. I would go rent movies if I knew I was having a lazy night in. It was perfect. To be fair I haven't used them since then but the nostalgia is real. Thanks for writing this up. I love this :) It's so sad, I really miss it! The Milo and Otis thing made me laugh - that was a great movie though, I need to watch it again. And that exhilarating feeling of seeing that one last "new release," up on the shelf and being the one to get it!!! Too exciting! It's so sad!! I did blockbuster online for years with in store rentals and mail delivery. I LIKED going into the store for movies. Then they started shutting them all down so I went online only. Then their services sucked so I event though I felt bad I switched to netflix. I think it's sad because they started the mail movie thing first. They should have been the pioneers of the industry. Oh well. Am I the only person who realized that Sleeping with the Enemy and the recent Nicholas Sparks movie Safe Haven were the EXACT same movie? I was completely blown away as I was watching it, being like, wait, I've seen this before. Either way, great movie. RIP Blockbuster. Such a huge part of my childhood. We spent many a Friday night at the return counter waiting to see if one of our must-see movies was going to be returned. This is awesome! My brother and I were just talking about this over the weekend and got sad about it. Video rentals were our childhood! We had a little mom and pop one down the street that we walked to every weekend and rented scary movies we were way too young for on VHS. We didn't get Blockbuster around here until about 2000, but we had Hollywood Video and a boyfriend of mine was a manager there. Fun times! I also bought a lot of my DVDs there when they sold the old rentals. Oh, Milo and Otis. Do you know how many times I hear that after telling someone my kid's name? And I have one friend who calls Nolan, Otis now. Haha! And YES! to Karen's comment. We'd hang out at the front desk and make the employees sift through the giant stacks of movies or go check the bin outside for a new release. I noticed the same thing recently when I rewatched sleeping with the enemy!! So many memories of going to Blockbuster!! Is Hollywood videos out of business too? And wow, they could have bought Netflix?! I was just telling my mom how sad I am that there are no video stores anymore. It was part of the fun of the evening: going to pick out the movie. Wandering through the aisles, giggling at some of the ridiculous movies on the shelves, me trying very hard not to be scared by the horror film section. I'm sad that my kid will never know what it is to go to a blockbuster.